SETEC conference: what is the role of digital technology and robotics into architecture and construction? Will we soon see autonomous robots on construction sites? While this idea seemed like science fiction only a few years ago, digital tools are now offering new applications for architecture and construction. At a conference at setec on September 21, Hannes Mayer, an architect and researcher at Gramazio Kholer Research (ETH Zurich) and Russell Loveridge, managing director of the Swiss National Center of Competence in Research (NCCR) in Digital Fabrication, presented their multidisciplinary work in algorithmic design, new materials and robotic fabrication. Supported by numerous examples, their presentation highlighted the ways new technologies can be used to design very different construction projects (www.dfab. ch). In a world that has been financially unstable since the 2008 crisis and subject to both economic and environmental pressures, “you always need to adapt and even anticipate the context,” commented Russell Loveridge. One particular difficulty faced in construction is the communication between architects, engineers and other researchers, given their different specializations. “You’ve got a problem if three engineers in a room can’t find the same solution… and if three architects do find the same solution,” he joked. Digital tools could become essential in the design and implementation of new projects, especially digital prefabrication. What better example than the new building for the Institute of Technology in Architecture (ITA) at ETH Zurich? For the new laboratory built over an underground car park, the architects partly used robots to help build the roof. Another example of the use of digital fabrication and design tools in construction is the new Monte Rosa Hut in the Swiss Canton of Valais, which required robotic logistics, given its location at an altitude of more than 2,800 m. “Of course, robots will never replace workers,” explained Hannes Mayer. “But they will work with them. For the most difficult, dangerous or repetitive work, the presence of robots on site could represent real progress. 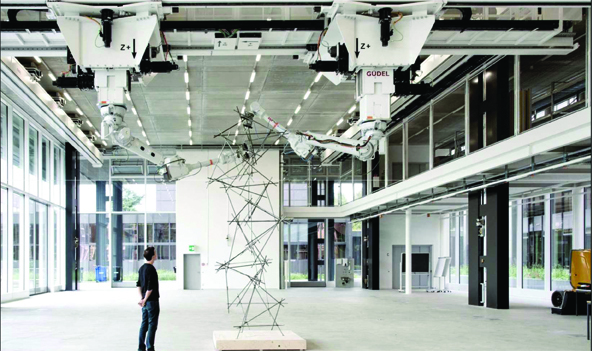 ” The researchers at the NCCR in Digital Fabrication want to offer builders new ways of designing their buildings, based on new construction technologies. The DFAB HOUSE (www.dfabhouse.ch) is a great example since it is the first house to be designed and built largely by robots and 3D printers. Using an entirely different approach, ETH Zurich also made a mark at the Chicago Architecture Biennial with “Rock Print.” Made entirely of little pebbles placed by a mechanical arm, this installation by Gramazio Kohler Research defies gravity with its own balance. Destroying the work is as easy as removing the wire holding the pebbles in place, which offers real savings in term of time, as well as economic and ecological production. “We are convinced robotics will change our approach to building, giving more freedom to project design and improving collaboration between the different construction teams,” concluded Hannes Mayer and Russell Loverdige. Hannes Mayer and Russell Loveridge, architects and researchers at the Swiss Federal Institute of Technology in Zurich (ETH Zurich), came to setec on September 21 to present their research into the role of digital technology and robotics in architecture and construction. Russell Loveridge answered our questions. Your approach to robotics in architecture is very innovative, but what are the practical applications for engineers and builders? Russell Loveridge: To start with, we’re researchers and we don’t have just one single objective. If that were the case, we would explore the creativity made possible by new technologies in architecture and construction. However, we are specialized in different disciplines. So our main goal is to explore creativity and intertwine disciplines that are normally quite separate. If you ask a robotics expert or an architect what seems creative to them, you will get two very different answers. Our aim is to find out what these two answers have in common through the use of new technologies, in order to create different projects. Is technology key to meeting the future ecological and economic challenges of construction? Is flexibility in terms of programming and application the main benefit of robotics?